I went on a garden tour yesterday. It was put on by the landscape architect who initially designed our yard. Six homeowners opened their gardens to strangers to raise money for several wonderful local causes. The gardens were lovely; the landscaping at one particular home was spectacular – the hardscape included an infinity pool set into a hillside overlooking the Diablo hills. Drool. Each home had a little different feel, some felt intimate, some felt showcased, and some felt comfortable and inviting. But, the interesting thing to me was that 5 out of the 6 homes had a space for raised beds to grow vegetables or herbs. I found myself spending more time investigating the raised beds instead of the landscaping. A couple of the homes had their raised beds situated off to the side in a far off corner. Hmmm. I’ve found that if you can see your beds easily from your house, you are more likely to stay on top of any issues that come up in the bed. One of the homes had their bed situated under some trees in the back corner of their lot, and had a bit more shade than wanted, but its possible that the afternoon post-noon sun hits it for an extended period of time. Another homeowner had their raised beds just down from a deck from the house, easy to see, out in the sun and fenced off nicely. That was my favorite. The raised beds were identical in appearance, because they were installed by the same subcontractor – all wood, and about 30 inches high, about 8-10 feet long, with ledges. I liked the height and the ledges because: (1) the height means there is ideally a lot of nice soil to work with; (2) if you have dogs, its too high for them to jump into, dig and/or lay in (if you’re a dog owner, you know what I’m talking about); (3) you don’t have to bend over so much when planting or weeding; and (4) there’s a nice sitting place while working, or just hanging out. Here is what I didn’t like: For each bed there were at least 6-8 sprinkler heads on risers about a foot apart. First of all, why so many? It was overkill. Secondly, why sprinkler heads? Sprinkler heads is a no-no for this type of garden. The sprinkler sprays not only water, but also any airborne bacteria onto the leaves, which creates an environment for diseases and molds. It was interesting to note that not a single one of the raised beds had driplines, and the beds didn’t appear to be used that much. So, maybe the owners’ hearts were in the right place, but the reality of raising food crops didn’t match their mental pictures. Before you put a raised bed in your space, take some time to check out and critique other raised beds (the good and the bad) – whether at a community garden, through a tour, at a neighbor’s house, or on-line. It’ll help you formulate a picture of what you want (and don’t want) for your space. 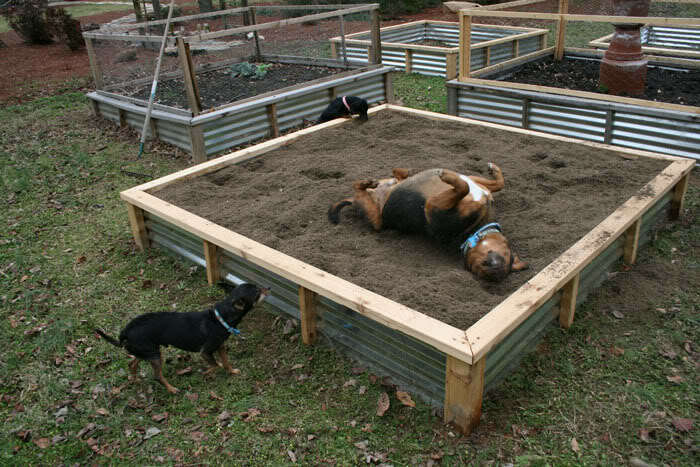 Those raised beds are nice, but far too complicated. I mean, if you have to hire someone to build it for you, you’ve lost the simpleness of it. I think they are too big too. You’re going to have to lean waay over the weed or pick veggies out of the middle. How do you protect against deer or birds? Netting will be difficult. Watering by sprinkler heads? Nice looking, yes…practical, no.